Hmm, you say you don’t like cauliflower or your family won’t eat it? Well, I trick my party guests and even kids into eating my Popcorn Cauliflower every time! I use dosa flour in mine, because I’m off wheat entirely and it’s made from lentils, which are ultra-high in protein. This recipe is easy-peasy. You might even get the kids in on this one. It’s easier than pancakes and much better for them. 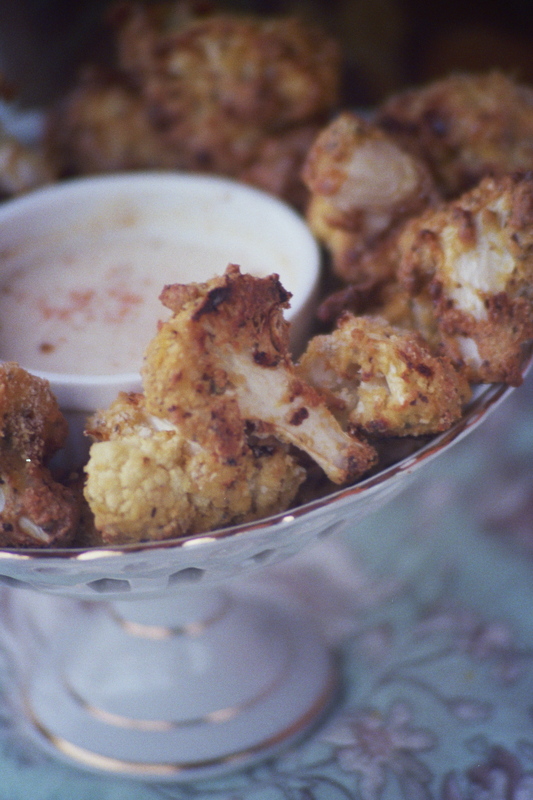 Popcorn Cauliflower is great for parties! Mix all the ingredients for the dipping sauce in a small bowl and place in the refrigerator to chill. Using your fingers, snap off individual cauliflower florets or cut them off with the tip of a sharp knife from the core. Slice any of the florets in half that are 2” round or larger. Place a buttered, glass, baking dish or cookie sheet in the oven to heat that will fit all the cauliflower in a single layer and allow for space in between the florets. Beat the two eggs together with a fork, in a large, deep bowl. Add the remainder of the ingredients with only as much water needed to form a thick batter that will not quite pour. Toss the cauliflower florets into the mixture and coat evenly. Then spread the battered cauliflower out on the hot baking dish, leaving space between each floret. Bake for 20 minutes or until the bottoms are crusty. Using a thin metal spatula to preserve the coating, turn the cauliflower and bake for another 15-20 minutes or until crisp and lightly browned all over. Serve hot with the chilled chili mayo.